This time of year always seems to bring more house guests, doesn’t it? San Diego is such a great place to visit all year ‘round, so I don’t blame people for wanting to be here for the holidays! I’m not complaining – we love to entertain – and we’re lucky to have a dedicated guest room to welcome friends and family. There’s nothing like having a space to call your own when traveling. A clean and comfy bed after a long day of sightseeing is a beautiful thing! If it’s possible to reserve a room just for guests, it can be lots of fun to create a pleasant and cheerful space. Who wouldn’t want to stay in a lovely room that rivals a hotel? I always provide blinds or shades to block out unwanted light. Even if travelers don’t come from different time zones, it’s nice for them to be able to sleep in if they want. If you don’t have a spare room, don’t worry! 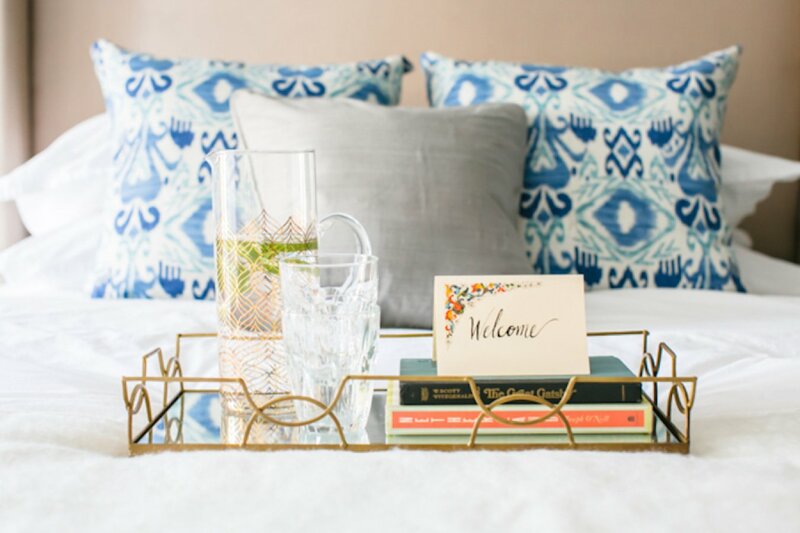 There are plenty of ways to make guests feel pampered, beyond clean sheets and towels, and a place to lay their weary heads. If you’re expecting multiple guests (a couple or a family), bathroom time will benefit from giving each person a slightly different colored towel set – especially in a shared bath. I find this small act to eliminate a lot of confusion in an unfamiliar bathroom. And if your towels have seen better days, now would be a great time to stock up on new fluffy ones – you can find some great buys at Home Goods or Target. A pretty blanket or quilt and some comfy pillows (of varying densities) will provide a restful place to sleep. Something that my guests always appreciate is a basket of toiletries that they can help themselves to in the bathroom. I save the extra toothbrushes I get from the dentist just for guests. All of those luxury small-sized toiletries from my own travels? Yep – shampoo, conditioner, lotion – all go in the basket. I fill it out with sample sizes of sunscreen, cotton swabs, toothpaste, etc. to provide everything they may need. And if you have a pool, don’t forget to stock up on plenty of pool towels! I prefer to stay in apartments when I travel, and took a cue from places that provide a “cheat sheet” with important information, creating one for my own home. I include the Wi-Fi password, important telephone and cell numbers, the alarm code and instructions on how to keep their belongings safe from my nosy pups. I find that writing everything down helps in the bustle of arrival. I also provide an area map and trolley schedule – kids of all ages love to take it at least once while visiting! Including a couple of local magazines can help give guests ideas of fun things to do in the area as well. Most of all – have fun! Each visit is an opportunity to create memories that last a lifetime.